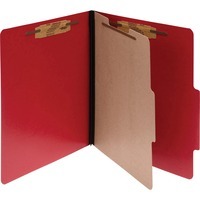 Brightly colored, durable classification folder separates documents into four parts offering more storage than a traditional pocket folder. Classify and identify contents by color coding or use the tabbed dividers and covers for titling. Presstex is specially coated to be moisture resistant and tear resistant. Handy partitions keep records separated, and fasteners keep papers from getting lost. Tyvek reinforced, expandable file gusset provides maximum durability. Four part classification folder offers a 2 capacity for your letter size documents and contains one center leaf and four 1 fasteners.